In this article, you'll find Social Learning tips, advice, and techniques for creating a successful Social Learning Strategy. From research to implementation, I'll walk you through on how to develop a Social Learning Strategy that engages learners and encourages collaborative eLearning. In today's tech-savvy world, it's pretty common to carry on conversations with people halfway around the world, or to tap into a wealth of informational resources without even leaving home. As a result, learning via social media platforms is becoming ever more popular. But, how can eLearning professionals take advantage of the opportunities that social learning offers? And what are some elements that should be included in every successful Social Learning Strategy? Pinpoint your primary eLearning objectives and decide which social networking platforms you're going to use. What do you want to achieve by integrating social learning elements? What is your goal? For example, do you want your learners to benefit from group collaboration to fully explore the subject matter, or are you striving to include more real-life based learning activities that require social interaction? Once you've decided upon your primary eLearning objectives, you'll then need to decide where this interaction will take place. Do you want social learning to take place within your LMS, or will you be relying solely upon social media sites? Are you going to utilize Facebook or Twitter to enhance the learning experience? One of the best things about social media learning is that you can give learners access to invaluable resources and references that they can utilize immediately. Rather than updating your eLearning course with a link to an article that the learner might find helpful, you can simply post that link on your Facebook page and enable learners to acquire that new information right away. Post regular updates on your blog or tell learners about a new site that can help them to learn about the eLearning course's subject matter via Twitter. When it comes to social learning it all hinges upon group collaboration and interaction. The primary goal is to get learners involved with the core content and with their peers. Through this social interaction not only they gain a better understanding of the subject matter, but they also learn from the experiences of their peers. This is why it's essential to encourage group collaboration through social learning tools. Spark the discussion and then let it run its course (with minimal facilitator feedback or intervention). Ask them questions that make them interact with each other via posts or introduce a problem that they can solve it by working collectively. eLearning Feedback is key to your overall social learning strategy. Without having your learners’ view, you won't be able to gauge their experience and improve upon your eLearning courses’ weak areas. So, why not encourage them to offer their feedback via social media platforms, where other peers can join in the topic and share their opinions as well. This will give you the opportunity to gauge how many of the learners feel the same way as their peers about a certain topic. For example, if one learner states that the second module of your “computer training 101” eLearning course is too challenging and fifty others agree, then you may want to rethink the difficulty level of that particular eLearning module. You can't have an effective social learning strategy without learners’ involvement. Remind your learners that the social tools you are utilizing allow them to get even more out of the eLearning course and that they are an integral part of the process. If at all possible, include buttons on your site or within your LMS that direct the learner to your social media pages or profiles, so that they can quickly and conveniently "follow" or "friend" you. A successful social Learning strategy is one that encourages learners not only to interact with the post, but also to share what they have learned with others. Ask your learners to share the posts with others. Or, better yet, create tweets or posts that are so engaging and informative that they wouldn't think twice about clicking the share button. Get them talking about your eLearning course and your content by providing them with an experience that is interactive, exciting, and invaluable. This way, they keep coming back for more and at the same time they encourage their friends and co-workers to do the same. 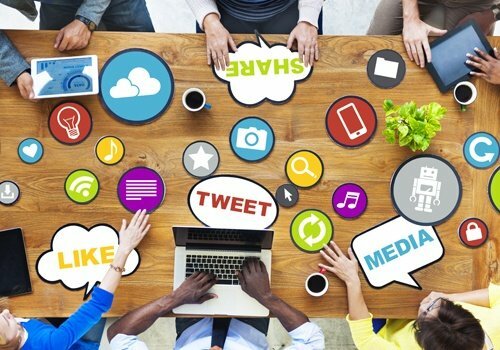 Looking for tips on how to effectively utilize social media in eLearning? Read the 28 eLearning Tips for Social Learning article to find out about 28 top tips on how to use Facebook, Twitter, and other social media platforms in your social learning strategy. Moreover, in The Role of Social Media in eLearning article you will find valuable information concerning the use of social media in eLearning plus some tips on how social media can be used as learning platforms.